Viele Blumentiere können nur in einem fadenalgenfreiem Aquarium gepflegt werden. Femanga Algenstopp! Marine ist ein natürliches Mittel und drängt die Fadenalgen sicher auf ein natürliches Maß zurück, ohne Fische und Blumentiere zu schädigen. Green filamentous algae are certainly desirable in saltwater aquariums, but if the algae growth is rampant, it could cover the invertebrates and suffocate them. Many flower animals can only live in algae-free aquarium. Femanga Algen Stopp! Marine is a natural medium and represses filamentous algae growth to a natural level without harming fish and flower animals. Shake well before use. Filter charcoal must be kept away and UV lamps should be switched off. Add 12.5ml to 100 litres of aquarium water 1x weekly in the morning and evening for 4 weeks. Just as a precautionary measure, take half the dose every 2 weeks. Attention: Use biocides safely! Carefully read the product information before use. Do not overdose! 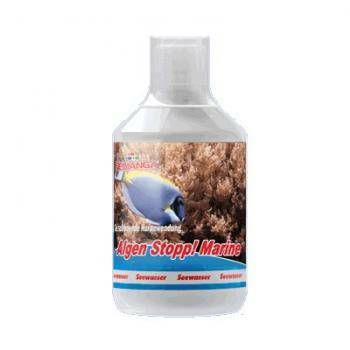 Compatible for microorganisms, fish and aquatic plants. When used properly, no side effects were observed. Note: Empty packaging completely before recycling! Keep out of reach of children. First Aid: In case of contact with eyes, immediately rinse the opened eye for 10-15 minutes with running water. In case of ingestion, immediately rinse your mouth and drink plenty of water. Do not induce any vomiting. Do not administer in cases of unconsciousness or convulsions. Consult a physician in case of skin irritation or if problems persist.